Around half of all babies under the age of one show signs of flat head syndrome to some extent. Despite this, many people still raise their eyebrows when they see a baby in a corrective helmet. Recently, this issue was brought to the fore, where, having shared pictures of her daughter in her helmet, tabloids such as Bravo questioned reality star, Meghan King Edmond’s mothering capability. To help you turn those stares into smiles and reservations into reassurances we’ve compiled a guide to plagiocephaly helmet designs. What Plagiocephaly Helmet Designs Are Out There? Many parents choose to get their little one’s helmet painted. 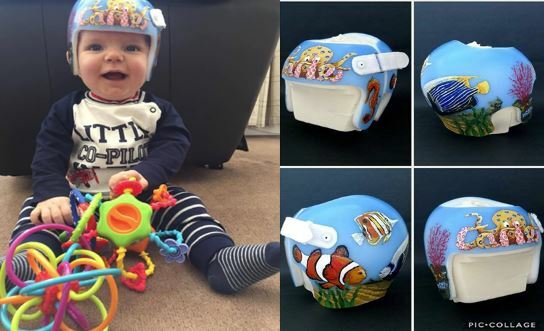 One such parent was lovely mummy, Nicky Jayne, who had her little man Carter’s helmet painted with his favourite underwater character, Nemo. The artist who completed the work was Charlie from Charlie’s Bespoke Art. An incredible, Leeds-based artist who is passionate about helping children, Charlie loves bringing families’ ideas to life through his illustrations. Question: What inspires you as an artist? Answer: ‘I have always, even from a young age, been interested in and gifted at drawing. I took a long break from any artwork (20 years), but, a few years ago I decided to pursue my passion. My main inspiration as an artist is immortality as I would love to be remembered long after I am gone as someone who can inspire others! Question: What designs are you able to create? Question: What turnaround time could a parent expect on their child’s helmet? Answer: ‘Once all design discussions and sketches/Photoshop layouts have been fully approved by the parents I would require two full days to paint it. If, for example, a parent arranges delivery of a helmet to myself by Wednesday PM, I would spend Thursday and Friday painting the helmet before it would be ready for collection or delivery on Saturday AM’. Question: How much would you charge for a helmet to be painted? Answer: ‘It is an absolute pleasure to see little kids with plagiocephaly looking less “medical” while they heal. So, including design chat, layouts, photo mock ups and all painting materials I would be willing to do this work for a price of £150 per helmet (carrier charge not included)’. If you would like to chat to Charlie about your child’s helmet design, he can be contacted by phone on 07940 472009 and via email at [email protected]. Denver Broncos baby helmet (left), R2D2 helmet design (centre), ‘I do my own stunts’ helmet (right). If you prefer a little DIY, you could decorate your child’s helmet using designer decals from Bling Your Band. Stylish, easy to apply and covering a range of themes from super heroes and princesses to Minions and Harry Potter, the high-quality decals from Bling Your Band never fail to impress. Want to make the decal a little more personal? No problem, all 200 designs from Bling Your Band are fully customisable! Question: What are your most popular designs? Answer: ‘Probably not always what you might think. The most popular design is turning the helmet into R2D2, and with the popularity of Star Wars that does not surprise me. But the second most popular design is Dr. Seuss, and the third most popular is based on Peanuts. Those are kind of niche themes and I didn’t expect them to be so popular’. Question: What is the average turnaround time? How long does it take for the ordered decal to be made and sent across to the UK? Answer: ‘I work really hard to get a proof out for just about all requests in one business day. Even with custom orders. International shipping can be difficult as the post office is the only practical method. Sometimes postage is fast, just a few days, at other times, postage can take two weeks, for no apparent reason. I frequently have to reship international orders’. Question: Is it possible to create custom decals? Answer: ‘Yes! Most of the designs started as someone’s “can you make something like . . .”. Many people want to just mix and match across existing designs, and that is totally cool too’. Make sure that the surface of the plagiocephaly helmet is clean, dry and smooth. Peel off the plagiocephaly helmet stickers and apply them to the outer surface of the helmet. Once you are happy with the positioning of the decals, press them firmly down and remove any lumps and bumps. To make the decals more durable, apply a thin layer of Mod Podge across the entire surface of the helmet and allow to air dry. Baby Ardle in his truck-patterned TiMband. If you and your little one are into psychedelic prints, then the TiMband helmet pattern transfers are for you. Choose from 20 colourful designs including brown cuddly bears, pretty purple butterflies and green whizzing planes. Once chosen, the design is lovingly printed onto the co-polymer shell of the TiMband to bring a pop of colour and excitement to your little one’s helmet. People will be stopping and staring for all of the right reasons, trust us.